“This town is a sanctuary.” HBO just released the premiere date and a new teaser for their upcoming Deadwood movie. The TV movie will be a follow-up to the HBO series, which ended in 2006. Returning cast members include Timothy Olyphant, Ian McShane, Molly Parker, Paula Malcolmson, Kim Dickens, Brad Dourif, Anna Gunn, and John Hawkes. HBO‘s Deadwood film debuts on May 31st at 8 p.m. ET/PT. As IndieWire reports, the movie premieres on the last day 2019 Emmy eligibility. Deadwood earned 28 Emmy nominations and eight wins during its original run. The HBO Films presentation DEADWOOD will debut FRIDAY, MAY 31 at 8:00 p.m. (ET/PT). In this original movie based on David Milch’s acclaimed, Emmy®-winning HBO series of the same name which debuted 15 years ago today, the indelible characters of the show are reunited after a decade to celebrate South Dakota’s statehood. Former rivalries are reignited, alliances are tested and old wounds reopened as all are left to navigate the inevitable changes that modernity and time have wrought. Returning cast members include: Ian McShane, Timothy Olyphant, Molly Parker, Paula Malcomson, John Hawkes (HBO’s “Eastbound & Down”) , Anna Gunn, Dayton Callie, Brad Dourif, Robin Weigert (HBO’s “Big Little Lies,” “Angels in America”), William Sanderson (HBO’s “True Blood”), Kim Dickens (HBO’s “Treme”), Gerald McRaney, Sean Bridgers, W. Earl Brown and Keone Young (HBO’s “True Blood”), among others. The film will also feature new cast member Jade Pettyjohn. During its three-season, 36-episode run on HBO from 2004 to 2006, the “Deadwood” series was nominated for 28 Primetime Emmy® Awards, winning eight, including Outstanding Directing for a Drama Series (Walter Hill). The series also received a Golden Globe Award for Best Performer by an Actor in a Television Series – Drama (Ian McShane). What do you think? Are you a big fan of Deadwood? Are you excited for the movie? More about: Deadwood, Deadwood: canceled or renewed?, HBO TV shows: canceled or renewed? 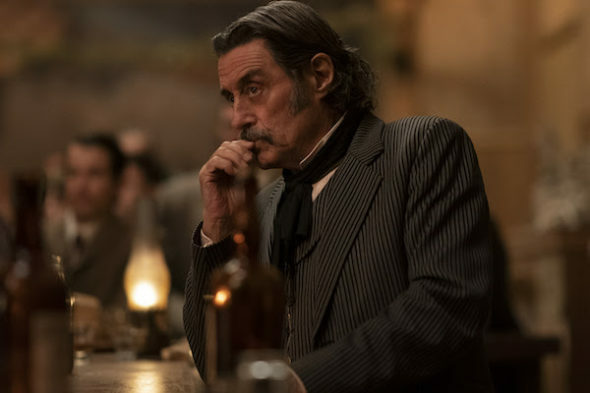 Deadwood: What’s the Latest on the HBO Follow Up Movie? Bucket list complete. I was heartbroken and angry when HBO cancelled Deadwood. The lame reasons afterwards made it even worse. This has been long wanted and waited for, I’m so excited that it’s almost here!